Review of "Take Two" 6/23/18 by Eva Diaz Thursdays, 10/9c on ABC. This show is from the creators of "Castle"; since I'm a fan of that show and still miss it, I thought I would watch this show and see if I would like it. The show is similar, so I think "Castle" fans will enjoy it. Rachel Bilson stars as Samantha Swift, a recovering drug and alcohol addict who was the star of the popular TV cop show "Hot Suspect," until she had a breakdown on the red carpet after she found out her show was canceled and her boyfriend broke up with her. When Samantha gets out of rehab, her agent is only able to get her one audition for a movie where her role would be a private investigator. Samantha decides to research the audition by following a real private detective named Eddie Valetik, played by Eddie Cibrian. Eddie used to have a high profile detective agency, until he turned one of his high profile clients into the police; he now has a small agency. Once he solves his first case with Sam, he gets much-needed publicity for the agency. This show has the same basic elements as Castle: the drama, mixed with some comedy, and the sparks flying between the flirtatious characters. I think that Rachel Bilson and Eddie Cibrian are still trying to find their rhythm and timing together. They seem a bit stiff and nervous at times, as they do the funny parts of the show together. On Castle, Nathan Fillian and Stana Cadic had their timing down from the first episode, they had instant chemistry. It wasn't hard to imagine them as a romantic duo right away. I will continue watching, though, because I am sure that Bilson and Cibrian will get into a groove as the show goes on. Also, the show is fun to watch, and I must admit I wasn't expecting to like it, because at first I thought it was going to be "Castle," with the characters in reverse. I would say it's a bit like "Castle" and "Moonlighting" put together. If you have never seen the show "Moonlighting," you can watch episodes on YouTube. I give this show 4 out of 5 stars because it's worth watching. 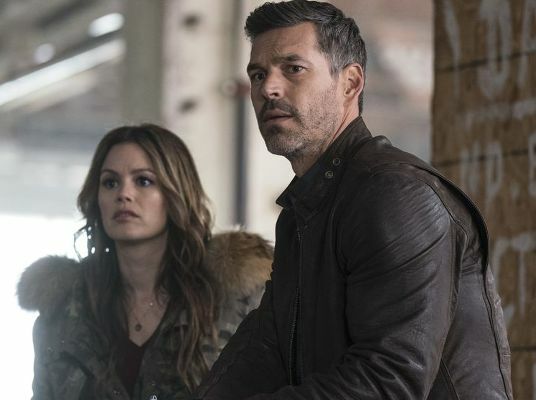 ABC’s “Take Two,” the network’s newest procedural crime series starring Rachel Bilson (“Hart of Dixie,” “Nashville”) and Eddie Cibrian (“CSI: Miami,” “Rosewood”), is set to premiere THURSDAY, JUNE 21, at 10 p.m. EDT. From Terri Edda Miller and Andrew W. Marlowe, the creator and executive producers of ABC’s highly popular series “Castle,” comes this upbeat detective series that follows Sam Swift (Rachel Bilson), the former star of a hit cop series whose epic breakdown is broadcast to the public and sends her to rehab. Desperate to restart her career, she talks her way into shadowing lone-wolf private investigator Eddie Valetik (Eddie Cibrian) as research for a potential comeback role. Though Eddie resents the babysitting gig, high-spirited Sam uses the skills she learned as an actor playing a cop and proves herself to be surprisingly valuable. The cast also includes Xavier de Guzman, Aliyah O’Brien and Alice Lee. “Take Two” is created and executive produced by Terri Edda Miller and Andrew W. Marlowe, along with Studiocanal TV’s Rola Bauer and Tandem Productions’ Tim Halkin. The pilot was directed by John Terlesky. “Take Two” is produced by Tandem Productions and MilMar Pictures in co-production with ABC Studios. “Take Two” was co-developed and co-financed by ABC, VOX and France 2. Since opening its doors in 1999 by Rola Bauer and Tim Halkin, TANDEM has established itself as a leading provider of quality drama television productions that have garnered nominations and awards such as Golden Globes® and Primetime Emmys®. TANDEM develops, finances and produces primetime programs for the worldwide market: award-winning The Pillars of the Earth and World Without End, adapted from the novels of internationally bestselling author Ken Follett, are just two examples of TANDEM’s critically acclaimed productions. The end of 2011, STUDIOCANAL took a majority stake in the company. This enabled TANDEM to strengthen its one-hour series strategy, leading to TANDEM’s production of the one-hour procedural crime series, Crossing Lines and the one-hour drama series, Spotless, a CANAL+ Création Originale. Presently, TANDEM is developing Shadow Play for ZDF, a series written by Måns Mårlind (Bron – The Bridge, Midnight Sun), who will also direct together with Björn Stein. Two other key development projects include Brazza, a series that TANDEM is joining forces with Idris Elba’s production company, Green Door Pictures, and Miami – as series with music about the authentic Miami, written by Juan Carlos Coto, Coto will show-run together with the brilliant story-teller Callie Khouri and the musical genius of T Bone Burnett and Emilio Estefan. STUDIOCANAL, a 100% affiliate of CANAL+ Group held by Vivendi, is Europe’s leader in production, right acquisition, distribution and international sales of feature films and TV series. In addition to its theatrical division, STUDIOCANAL is actively developing and distributing high-end TV series through its network of award-winning subsidiary production companies including TANDEM Productions in Germany (Crossing Lines, Spotless) and the UK’s RED Production Company (Safe, Happy Valley). STUDIOCANAL is also partnered with SAM Productions founded by Søren Sveistrup (The Killing), Adam Price (Borgen), and Meta Louise Foldager (A Royal Affair). The UK based GUILTY PARTY PICTURES, run by the producer Spencer Millman, (Harry Hill’s TV Burp), and the actors and writers Simon Bird (The Inbetweeners) and Jonny Sweet (Chickens). FINAL TWIST is an independent production company launched by the international best-selling author Harlan Coben in partnership with RED’s Nicola Shindler. Other investments include Benedict Cumberbatch’s UK production company, SUNNYMARCH TV (The Child in Time), the Madrid-based BAMBÚ PRODUCCIONES (Grand Hotel, Velvet), and the UK’s URBAN MYTH FILMS (Crazyhead), founded by Johnny Capps and Julian Murphy (Merlin) and Howard Overman (Misfits). *COPYRIGHT ©American Broadcasting Companies, Inc.